Be kind no matter what. Let go of all darkness you hold inside you and free your mind of negativity. The world will continuously test your strength and every test you receive is a test of your character. Will you choose to be a loving person, or will you hold in anger and let it seep out for the world to see? If something is bothering you, fix it. If you do not like the situation you are in, change it. Don’t hold yourself in a place that does not bring you joy. Everyone can shine, everyone was born to do something great but it all starts with kindness and love. Positive people go a lot further then people who think negatively so if you are reading this today and do not feel good about yourself, it is time to change. Be good, do good, and good things will happen in your favor. Luck comes into play for people that are kind to themselves and other people. Free your mind and free your soul of all toxins and find inner peace. The most beautiful people are kind no matter what. The most beautiful people laugh until they can’t breathe. The most beautiful people make mistakes time and time again. The most beautiful people are real. The most beautiful people are broken but continue to fight. The most beautiful people help others. The most beautiful people get angry and jealous. The most beautiful people love deeper. The most beautiful people don’t give up. The most beautiful people trust. The most beautiful people do good no matter what. The most beautiful people see the light in dark situations. The most beautiful people are there until the end. The most beautiful people are crazy for life. The most beautiful people strive for more. The most beautiful people are wrong at times. The most beautiful people smile. The most beautiful people are themselves. Chill, relaxing and a refreshing change from my usual hyper love for main stage anthems, Amtrac aces this remix of Two Door Cinema Club’s Handshake. Indie dance continues to weave in and out of the EDM world and I can only see it continuing to grow. Indie rock is the perfect music for anytime a year, any occasion and now with DJ’s incorporating dance music into it, the music is only going to get better. The Irish band Two Door Cinema club does an amazing job of writing lyrics that work well with their choice of background sound, leaving it very easy for any DJ to come in and add some extra productions to the track. They slow down the track leaving you dancing in a dream, a calming summer dream. If you haven’t listened to this remix by Amtrac you must not wait any longer! Coming in as number one for eat of the week is the succulent `Red Burrito.` I set a new record on finishing this burrito in less than 5 minutes which is quite shocking if you knew how big it really is. It was my first time eating at the famous burrito joint positioned on Commercial Drive and East 1st. It was quite the experience on my lunch hour from the moment the clock turned 12pm my coworkers and I hustled to my car preparing ourselves for this burrito that awaited us. Vancouver is known for having a wide array of dining options so I am quite lucky when it comes to doing my favorite thing which is eating. Once we made it to the `Red Burrito` we looked up at the very simple menu which consisted of chicken, veggie, pork or beef. 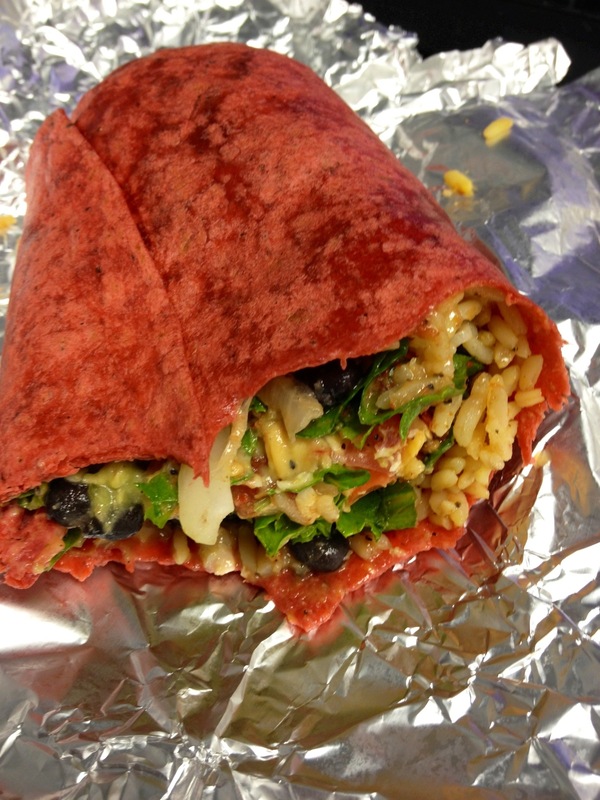 You picked your option and then created your burrito like it was a Subway sandwich. Now since I attempt on cutting down my meat intake I got veggie but obviously loaded up with salsa and a little extra of everything. My two coworkers got chicken and their burritos barely closed they were so fat. Once we hurried back to the office I ran through the doors almost hitting people as I raced to my desk. This was clearly an eating emergency! Food this good had to be devoured in less than 10 minutes. Much to my surprise I finished it in 5. Whether you live in Vancouver or are passing through, this hidden gem of a burrito place is a must have. I think anybody can relate to this post considering at some point in your life you would have attended such an event. Today for Friday Faves I am talking about why music festivals are the absolute best. It doesn’t matter what type of genre they are I think the love for music is truly universal and going to a festival brings people together. You can dance, drink, eat, sit and relax, whatever your heart desires! Every time I go to one, I feel like I can be myself and let go of all problems. The moment you step into a festival you are transported to a world of your own and you can most definitely leave any stress you have at the gates. What are some festivals you must attend in your lifetime? 1)	Coachella – California’s laid back music n arts festival in Indio California. 2)	Electric Daisy Carnival – Started by the event company Insomniac, EDC is all over the place now, this all night party should be high up on the bucket list. 3)	Lollapalooza – All types of music at this Chicago festival right along the water. 4)	Ultra Music Festival – Where it all started in North America, one of the most prestigious Electronic Music Festivals out there in no other than beautiful Miami. 5)	Sasquatch – Chill atmosphere and a beautiful night sky at the Gorge Amphitheatre in Washington. What more could you ask for? 6)	Tomorrowland – This one is massive and it is all the way in Belgium! Add this festival to your Europe trip next year. DJ Disaster of the week should be more like “Typical Thursday” of the week. Okay now I absolutely love dance music but some DJ’s need to give their head a shake when it comes to producing tracks. Why produce something unless it is quality work? Too many DJ’s these days are falling to mediocrity just to get a track out fast. It is true when they say many songs are sounding the same these days because they are and DJ’s are not taking the time to produce something that stands out. Take Daft Punk for example, they spent a long time in the studio, out of the spotlight and created Random Access Memories, which is a masterpiece. The culprit of my typical progressive house rant today is Dannic with his new track Ignite. This is sorry to say, completely boring! I think 10 DJ’s before you have already laid down this chord progression. Not only is it a repeat of most progressive house tracks it is also similar to his last track Clobber which unfortunately puts Dannic on the DJ Disaster of the week list. I don’t care if you are Hardwell’s buddy, until you treat us to something bigger I rest my case. Why settle for anything less than you deserve? Is there any reason that you do not deserve the best life ever? Most people become so comfortable in a content setting that they never fully reach their true potential. It is very possible with hard work and keeping your eyes on the prize that you will accomplish that dream. Never back down from achieving your goals, they are in your head constantly for a reason. Dive into the deep end in life, no need to tip toe in the shallow end because life is too short for that. If you want big things go out and get them, mediocrity is what most people fall into because they convince themselves that their dreams are unattainable. Here are my tips on reaching those goals! 1)	If it makes you happy, DO IT! – Most people are chasing after something because it makes them happy. So why not quit the things that no longer bring you joy and focus all your energy around the things that do. The more positive you bring into your life the better chance you will have. 2)	If you fall off, get right back on – Never give up! Life is never going to go exactly the way you want it to and there are going to be times in your life where you fail or fall off course. I used to beat myself up about not doing something or things not going exactly the way I wanted them to but then I told myself, “if you fall off your bike, don’t pout, get back on and keep riding.” Nobody’s perfect, you cannot be a super hero everyday so making mistakes on the way to your goal is necessary and all right. 3)	Consistency is Key – Like anything in life, the more you do it the better you get and the higher your chances. Being consistent at something is a long hard battle but if you find ways to set time aside each day, you will reap the benefits. 4)	Eyes on the Prize – This one is the most important for me, never take your eyes off the result. The journey and steps to get there are important but without an end in sight, you will run in circles. If you want to travel the world, focus on that and you will naturally work your way into saving and making it happen. If you want that dream job, keep your eyes on it and the universe will conspire to help you make it happen. Work hard, and do not look away from the prize.